1. When I was younger I loved reading but starting uni meant that it was never quiet enough for me to sit down and get lost in a book. I've got into the habit of watching things on my iPad before bed (usually Carpool Karaoke!) and it's not helping me to sleep so I recently bought a few new books and started reading again. I'm currently halfway through reading Me Before You by Jojo Moyes and so far i'm finding it hard to put down which is always a good thing! If anyone has any recommendations for any similar style books please let me know! 2. I updated my MacBook to El Capitan and i'm loving the new look! My laptop hasn't been properly updated for years but now I don't have to worry about losing any uni assignments I thought i'd take the risk! Everything is so much faster and other than a noisy fan, it's so much easier to use and i've finally been able to give my blog a little makeover too - it's the little things in life! 3. At the minute i'm loving the H&M In Store Playlist on Spotify. It's such a good way to discover new music and it's perfect to leave on shuffle while i'm blogging too. The new Walking On Cars album is also another recent favourite and i've been listening to it lots while i'm driving - At Gunpoint and Catch Me If You Can are such good songs! 4. Last weekend I met up with the girls and we had afternoon tea which was such a nice way to spend a Sunday afternoon. There's nothing better than gossiping and eating lots of cake and I also used it as an excuse to bake cookies and gingerbread which went down well too. Another food favourite that I discovered in January was the Chocolate & Love range. 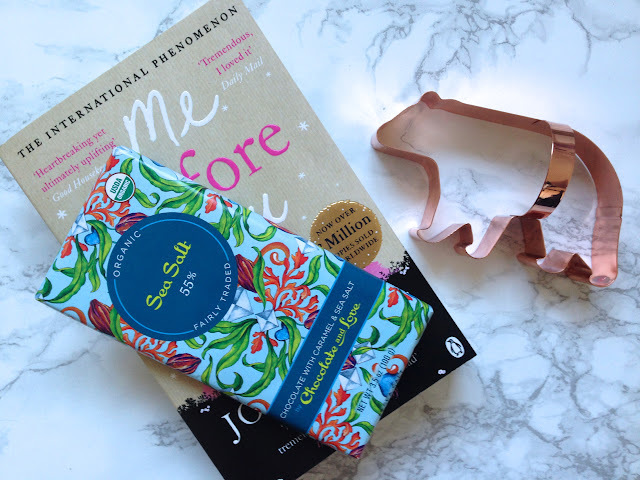 I'm obsessed with the Dark Chocolate with Caramel & Sea Salt flavour and how nice is the packaging?! 5. I thought i'd share some of my favourite blog posts as I love reading other people's recommendations. Rosie wrote this post about realising how far you've come, and as someone who doesn't have a lot of confidence and is their own worst enemy a lot of the time, it definitely gave me something to think about! Victoria also blogged about beating negativity in this post and my favourite part was when she said "You will always keep making progress" which is something that as a recent graduate, I really needed to read. Uni totally ruined reading for me too! I used to go through books like nobody's business and now I'm lucky if I remember to read, really need to get back into the habit! i think thats the prettiest packaging for chocolate I've ever seen! lovely post!